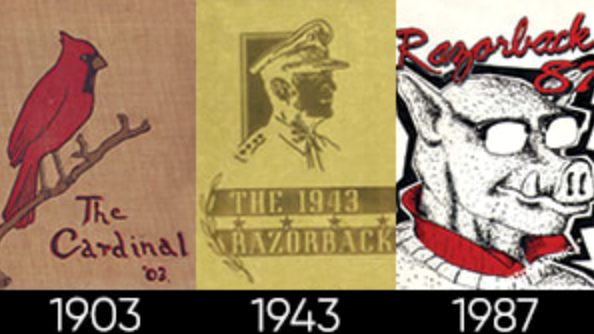 University of Arkansas yearbook covers from 1903, 1943 and 1987. Throughout the month of October, the University Libraries and The Razorback yearbook staff are raising funds for the digitization of University of Arkansas yearbooks. The anticipated cost of digitizing all yearbooks from 1897 to 2018 is $11,000. Yearbooks have proven to be some of the most frequently requested items in the Libraries' Special Collections department, but they can only be accessed in person at this time. The Libraries aim to change that by making all yearbooks available online. "Yearbooks are one of the most popular resources we have documenting our unique history at the U of A," said Amy Allen, university archivist. "The photographs are like a time capsule to transport you to a different era." In addition to providing a glimpse into the past, yearbooks represent the hard work and dedication of each year's staff. Students work year-round to document events, beloved Razorback traditions and changes to campus. "I'm always getting people asking me for old yearbooks, but we just don't have enough in our archives," said Megan Wilson, editor-in-chief of The Razorback for the 2018-19 academic year. "Putting it online would be a great way for everyone to have the book at their fingertips." Once they are digitized and made available online, yearbooks will be fully searchable. The ability to search will be of particular use to researchers and those looking for photos of family members. "It's a nationally award-winning yearbook," said Gerald Jordan, associate professor of journalism. "It's a record; it's our life. For the sake of alumni relations and alumni pride, we can't do better than a great yearbook." Supporters of the yearbook digitization project are encouraged to make a gift at fundrazor.uark.edu/yearbook, and to share project information with their networks through emails and social media.